Swarm Commander can be used in various methods of application. This product is a way of attracting a colony of honey bees that have swarmed. It is always best to place the product in a hive or trap prior to honey bees swarming. When applied to a trap or empty hive, Swarm Commander Premium Swarm Lure releases it’s “Pheromone” and “Sets The Bait” that will improve your success in catching wild honey bee swarms. These Vials (5) attract honey bees that have swarmed. It is always best to place the product in a hive or trap prior to honey bees swarming. 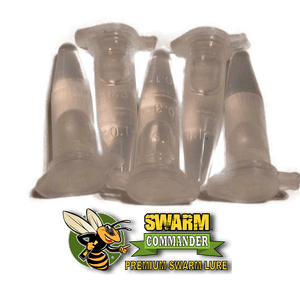 When applied to a trap or empty hive, Swarm Commander Premium Swarm Lure releases it’s “Pheromone” and “Sets The Bait” that will improve your success in catching wild honey bee swarms.Swarm Commander Vials are long lasting and do not need to be refrigerated and has a two year shelf life when stored in a temperature controlled environment.